I enjoyed many Robinson Crusoe story versions in my life starting from reading Daniel Defoe's book when I was at school to movies, cartoons and theatre improvisations. Every time each piece brings something fresh and touching what makes the story of Robinson who spent three decades in solitude encouraging. Though it is considered as a drama, I never thought it was. Robinson Crusoe name is always associated with challenges and adjusting to new world never seen before. This fall new animation movie The Wild Life is about to hit the big screen. 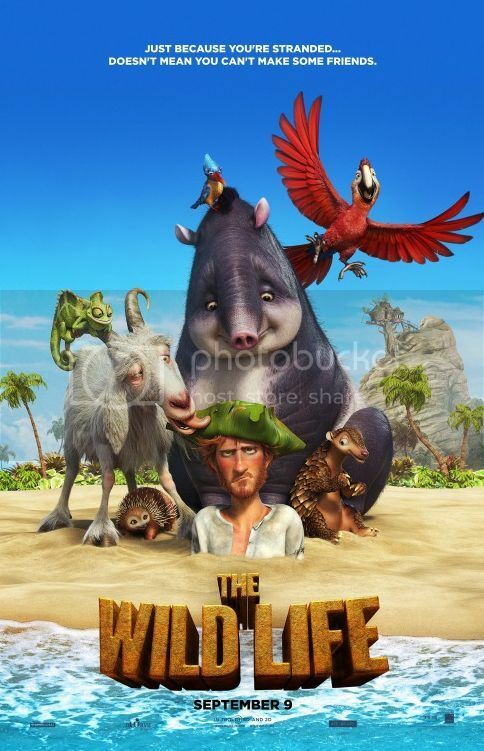 Based on the world famous story of Robinson Crusoe, The Wild Life, follows a shipwrecked and lost Robinson as he fights to build a treehouse. Watch as hilarity ensues for Robinson along with his case cast of zany wild animals as they all fight for survival. From the over-exuberant parrot Mak to the snack-obsessed tapir Rosie, from the persnickety echidna Epi to the acrobatic pangolin Pango, from the ditzy goat Scrubby to the commonsensical kingfisher Kiki and the always-cool chameleon Carmello, things are larger-than-life on a tropical isle that is pure wild animal paradise. Then Robinson Crusoe, a marooned human, arrives in the midst of a furious storm, and their lives are forever changed by this bewildering new "creature." No matter their differences, castaway human and quirky animals embark on an hilarious new adventure, building the island’s first tree-house and surviving together. But when two conniving members of the animal kingdom — the savage cats Mal & May – pounce into a battle for control of the island, Crusoe and his animal posse must uncover the true power of friendship against all odds (even savage cats). The movie is starring with Ron Allen, George Babbit, Laila Berzins, Ilka Bessin, Joey Camen, Jeff Doucette and Sandy Fox. The Wild Life is fun for children of all ages and will be a great way to spend time with the family this fall. The movie is out on Friday, September 9. Thanks to the generosity of eOne Films Entertainment, we are excited to giveaway family passes to the advance screenings of The Wild Life in the following Canadian cities: Toronto, Vancouver, Calgary, Edmonton, Winnipeg and Ottawa. The screenings will be taking place on Saturday, September 3, 10am. Each pass admit four. For your chance simply fill the Rafflecopter form below. This is a short time giveaway, ends August 31, 2016. Thanks for the great giveaway. My kids are really wanting to see this movie. Would love to see it in Calgary please. I'd love to attend the screening in Toronto! Ottawa please....looks like a fun movie! Thank you for the opportunity as this looks like a fun movie! Would love to see it in Calgary please! Thanks for the chance to see this movie Winnipeg please. My kids would love to see this movie in Calgary. Thanks! I re-sent your pass via e-mail, please take a look.